The Notebook is a multi-use booklet which includes the rules of the game, private notes and the ability to delete and create other pages. The Notebook starts off as an empty booklet that you can fill up as you’d like. 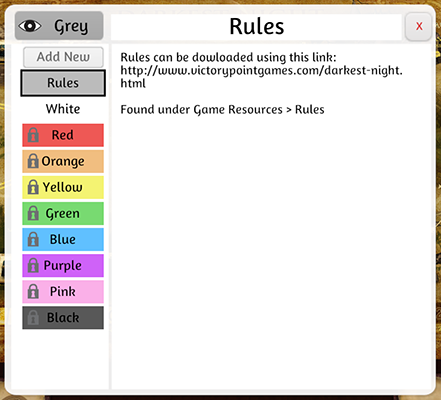 When a game is loaded, the Rules is the default page that is shown first. If you created a game then this is where you can add in the rules. If you prefer, you can create different tabs for different sections of your rules and name them how you’d like. Each tab can be deleted. Just hover over them and a trash can icon will pop up. A confirmation window will pop up so you don’t accidentally delete a tab. Tabs with a lock icon over them mean they are private and only viewable by those player colors. If you are on the same team, you can read each other’s notes. Game Masters can read all notes and Spectators can’t read any pages other than the Rules page. To create a new tab, click the “Add New” button. 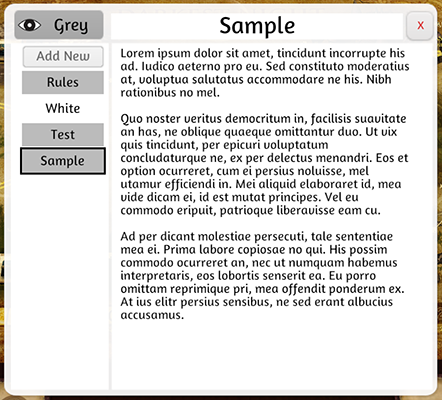 In place of the text caret, you can name your tab whatever you’d like. Then click the button above it with the eye icon and choose what color you’d like this tab to be. If you want it to be viewable to the public, click the grey color. Every other color will be locked to that player color. 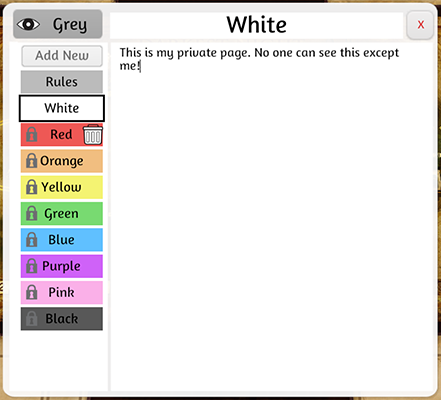 If all the tabs you create will be public, then after you name the tab, you can click on the page to begin editing it without choosing a color as it will default to grey.